‘Art of Movement’ dance program offers after-school dance classes at school. Using dance in order to ensure active students and to develop a healthy balanced life style. 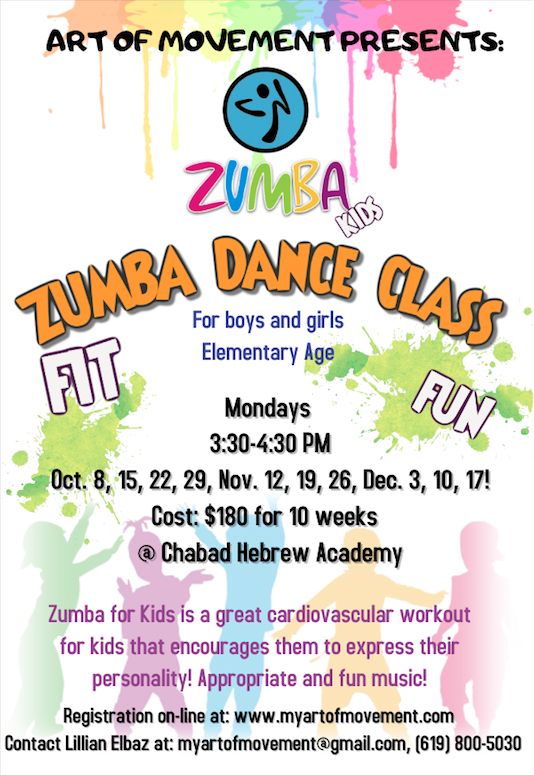 Each class includes warm up and stretch techniques, choreography and games. No previous dance experience is required. 1. Please choose your class below and press "ADD TO CART". 2. Fill our the After School Registration Form that opened. 3. Go to your cart in the upper right corner and complete the payment. * Credit card payments include a processing fee. To avoid that fee pay with cash/check. A minimum of 5 students is required to open a class. Payment for the whole session must be received no later than the day of your child's first class. All refund requests must be submitted in writing PRIOR to the 2nd scheduled class meeting. There will be no refunds offered after the 2nd week of class unless 'Art of Movement' cancels the program. Refund requests will be considered on an individual basis. All approved refund requests will be processed within ten (10) business days. If there are any medical conditions, allergies or special needs, please be sure to let us know. We take every measure possible to ensure your child’s safety. Fee for late pick up is $1 per minute. Workgroup disruptions (such as bullying, hitting, biting, indecent exposure, etc.) will not be allowed. The first incident will be handled by telephone call between the parent(s) and 'Art of Movement' Staff. The second incident will be handled in person with the parent(s) and Staff. The third incident will be cause for expulsion from the program. Refund will not be allowed. I agree that Lillian Elbaz take photographs/video/recorded voice of classes and performance for promotional purposes. I further release 'Art of Movement' from any liability whatsoever that may occur or be produced by the taking, reproducing, publishing, showing, or displaying of said video/recorded voice/photographs. Please note that the student's name will not be used in any public manner. Only a parent as listed below will be allowed to pick up the student from the enrichment. Please notify 'Art of Movement' in writing regarding any additional person(s) that you authorize to pick up your child. Thank you for your registration for 'Art of Movement's after school program! 2. You can leave cash/check at the front desk in a sealed envelope with your child's name and class. Checks will be made to 'Art of Movement'. *Payment for the whole session will be collected before the second class. A minimum of 5 students is required to open a class. A blend of Ballet technique and Gymnastics. Developing coordination and flexibility along with creative expression, musicality, memorization and confidence. Working on our ballet vocabulary by establishing more complex material such as pirouettes, jumps landing on one foot, port de bras and more. For both boys and girls. Spring Session Dates: May 2, 16, 23, 30, June 6, 13. *Credit card payments include a processing fee. Designed to explore different styles of dance. Hip-Hop, Ballet, Jazz, gymnastics and more. Kid-appropriate music all add to the fun! Winter Session Dates: Jan. 17, 24, 31, Feb. 21, 28, March 7, 14, 28, Performance on April 4, 11, May 2, last class on May 16! 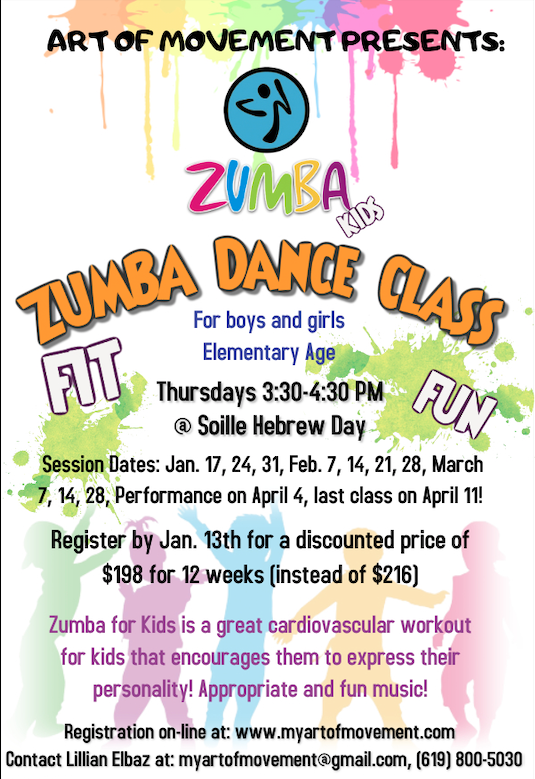 A blend of Hip-Hop, Ballet, Gymnastics and Hebrew learning. Israeli and Jewish songs are part of the fun. Learning and strengthening Hebrew vocabulary. Spring Dates: May 6, 13, 20, 29, June 3. The little dancers will learn the fundamentals of ballet, Hip-Hop and Music, all in fun and creative ways. We will move and groove to contemporary and classical Israeli and Jewish music. Spring Session Dates: May 6, 13, 20, June 3.